A true Star Wars movie for Star Wars fans, this one is dark, heavy, and very much about connecting pieces together that would provide a clear path to the original Star Wars film, A New Hope. 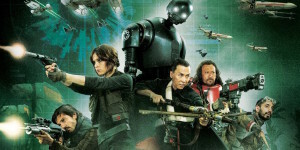 A pretty cool movie, this one is a thinkers Star Wars film with tons of connections to the original trilogy. It’s a very dark movie, (even darker than the Empire Strikes Back!) I suppose that’s to be expected from a movie like this that is about a deadly solo mission. Let’s just say, there’s a reason why this is a spin off film, and not part of the regular, episode, series. Some parts are a little too slow, and there’s z hell of a lot of information being thrown our way, at any given time. But the action is fantastic, and the connections to the Star Wars film, A New Hope, are really clever. Rogue One is pretty cool. It’s different. This is the most serious, and the most heavy of all Star Wars films. By heavy, I mean that there is a lot of death and a lot of drama. This is the one that is the most for adults. This is the film that is overloaded with names, details, and Easter Eggs to the original Star Wars movies. Connecting the pieces is a lot of fun, but it sure ain’t easy. Last year, the sequel Star Wars movie The Force Awakens came out, bringing Star Wars back to the big screen for the first time in over a decade. It was fantastic, providing really cool action scenes, humorous moments, and fun characters. That film was mostly light hearted and colorful. Rogue One is not. In fact, it is pretty much the exact opposite in nearly every one of these ways. It’s still a fun movie, but there is nothing light-hearted or colorful about this one. If A New Hope began with Princess Leia getting the plans to The Death Star, (a villainous weapon of the Empire that can destroy whole planets by blowing them up,) then this is the story of what came before. Ita the story of how those plans came to land in Leia’s hands. 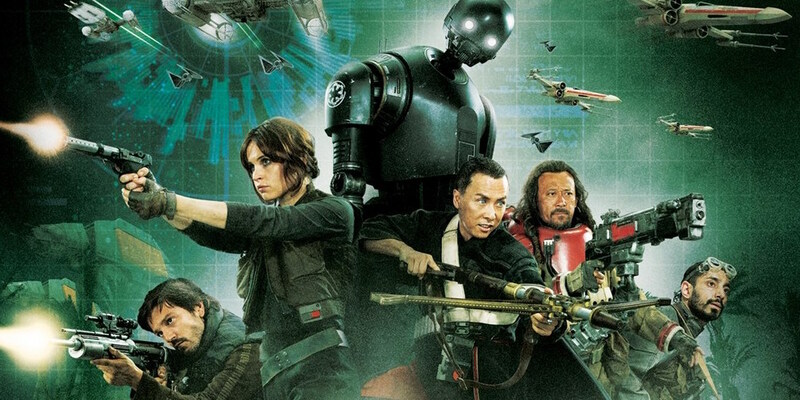 Rogue One is the story of a father and his daughter (Galen and Jyn Erso,) and how the two of them were the people most responsible for both building and destroying The Death Star. At the start of the film, we are with Galen and his family, (his wife and his little girl, Jyn,) as they are in hiding on a secluded planet. An Imperial Weapons Officer named Krenic, (Ben Mendelsohn,) arrives to take Galen away. Galen is a scientist. He is being kidnapped and forced into building the Death Star, but not before his wife is murdered and young Jyn runs away. Yeah, this is pretty dark stuff. Jyn is found and raised by a rebel leader named Saw Gerrera, (Forest Whitaker.) After this, we cut away from the story of the child, and pick up with Jyn again, as an adult, (played by Felicity Jones.) When we rejoin her, Jyn is being held in prison by imperial forces. Rebels bust in and help her escape. Jyn is now told that her father may still be alive, and that the rebels want to get him back to their side. 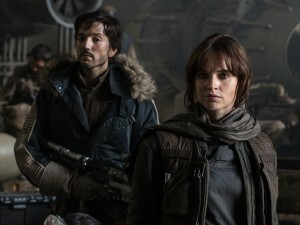 They are hoping to use Jyn to do it. There’s a pilot, Bodhi Rook, (Riz Ahmed, from the HBO mini series The Night Of,) who has stolen a hologram message of Galen. Now Rook’s being held as a prisoner by Gerrera. And then there’s the rebel Cassian Andor, who may or may not have orders to kill Jyn’s father, Galen. Not only is there a lot of information here, but also a lot of questions raised. Why did Gerrera leave Jyn, and what has she been up to since? Why is Rook being held prisoner by Gerrera?And why does Andor have orders to kill Galen? While we do wonder about these answers, we also do get a little lost along the way. The truth is, the middle act of this movie is kind of slow. It’s also kind of hard to follow, with all of the names of unfamiliar characters, and planets. Unlike any other Star Wars movie in the series, this one is composed almost entirely of new characters. I suppose that’s the reason why it’s not an episode. This is more of a spin off film. While the the middle act is definitely slow, the final act more than makes up for it. A message gets transmitted that the Death Star was built in such a way that it has a weakness intentionally built into it by Jyn’s father. Upon hearing this and seeing a test of how destructive the Death Star actuwlly is, Jyn decides the only way to find the weakness is to get a copy of the blueprints, or plans. So she sets out with a group of rebels to steal those plans from an enemy base. One of the coolest things about this movie is its use of villains. Darth Vader makes some short appearances, (2 memorable scenes,) and so does a familiar face from the original Star Wars movies. Admiral Tarkin. He is one of Darth Vaders leading commanders, and computer technology wizardry has brought him back to life, (the actor passed away decades ago,) for a number of scenes in this movie. It’s pretty fantastic. Krenic is the lead villain of this movie and he’s just okay. Knowing the actor, Mendelsohn, from Blood Line, and what he’s capable of, I wish he had been given a little more. And that middle act is definitely too slow. But other than those things, this is a good film. The action, in the final act, is absolutely fantastic! It really feels like a war. And the connections to A New Hope, that basically end this film just moments before that one begins, are pretty remarkable. This is some very cool stuff.